With winter coming and my body trying to adjust to the weather changes, I’m incorporating more probiotics again. Fellow Toronto vegan and RD Pamela Fergusson posted this article about prebiotics vs probiotics, inspiring me to be good to my gut and make something that combined the two. So I tried to incorporate foods with tons of good-for-your-gut fibre while also creating a balanced bowl. Wild rice is fun to eat, filling and full of protein (surprisingly enough! 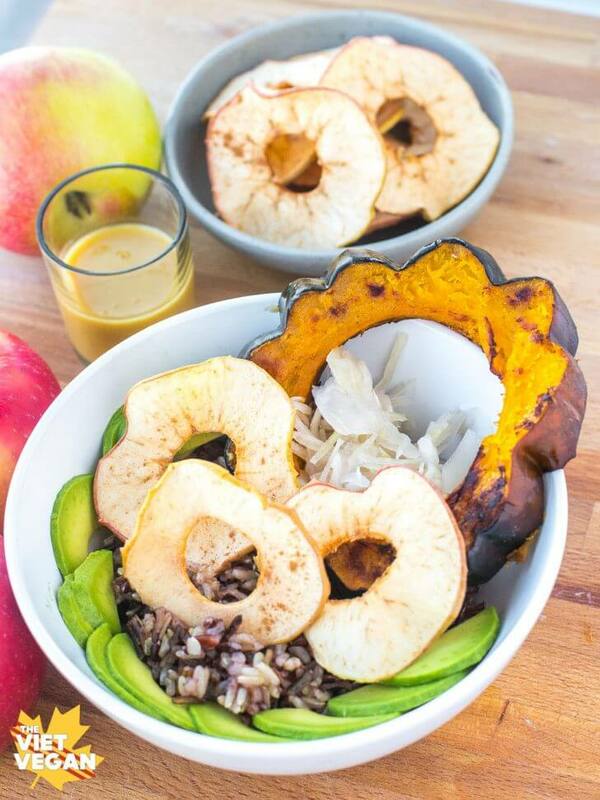 ), roasted acorn squash and avocado add creaminess, sauerkraut adds probiotic goodness with a hit of acidity, and of course, fibre-dense apples chips give a fun little crunch to the bowl. 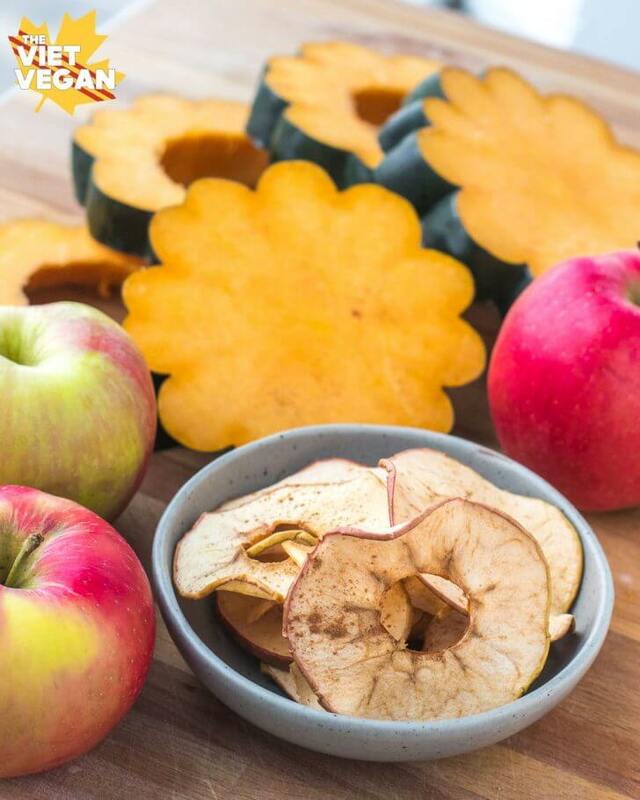 You could enjoy julienned or finely diced apple on top, much like a salsa, but I wanted the concentrated apple flavour that apple chips have. To be honest, I had been experimenting with an apple and onion recipe (inspired by Little House on the Prairie), but I prefer the texture of cooked apples when it’s accompanied by crisp cinnamon streusel and vanilla ice cream. So I opted for something I knew I loved, which were apple chips (which I previously made with another Ontario apple!) I used Honeycrisp apples for this, but you can try using another other sweet apples listed on the Ontario Apple Grower’s guide like Ambrosia, Red Prince (the apples I originally used in my apple chip post), Fuji, or Gala apples. I knew the crunch would be a great complement to the chew of the wild rice and creaminess from the avocado and roasted squash. Top with this tangy, sweet dijon dressing and it’s a simple meal that just takes a little prep ahead of time. 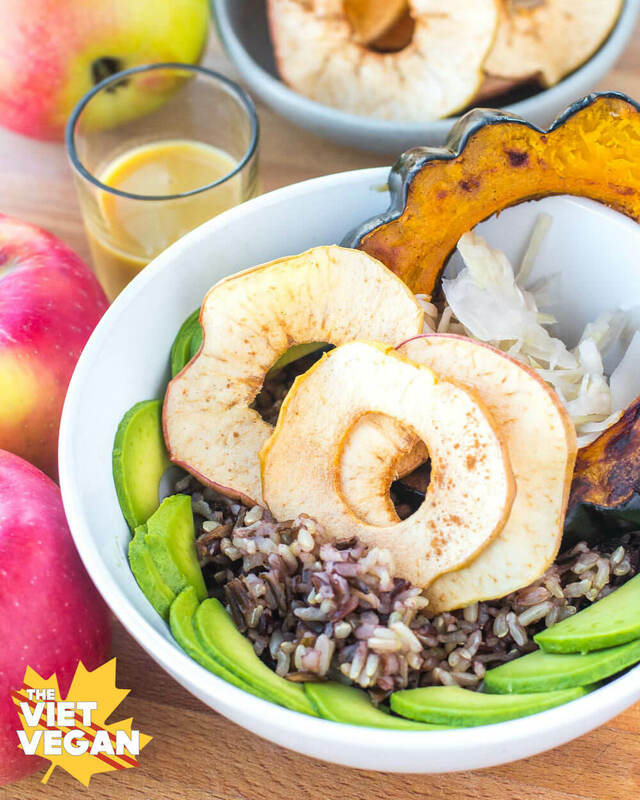 For more crunch and protein, feel free to add pumpkin seeds or slivered almonds, but wild rice has a surprising amount of protein on its own.If you’re a fan of cooked apples, maybe you could even roast them along with the squash, but I much prefer the crunch. Lightly toss acorn squash with vegetable oil and spread onto a lined baking sheet. Sprinkle brown sugar on top if you want it extra sweet and caramelized (optional). Bake for 30 minutes until caramelized and fork tender. Make whisk together dressing ingredients and set aside. Assemble bowls by layering rice, avocado, sauerkraut and squash. Either add apple chips on top whole as a crunchy chip, or crumble so that they soften slightly as you eat and provide an extra sweet burst of apple flavour (I prefer the crunchy chip method). Enjoy with a light drizzle of the Dijon dressing and enjoy!